Sometimes referred to as pterodactyls, pterosaurs were the first vertebrates known to have been able to fly. They suddenly appear in the fossil record during the late Jurassic period, around 220 million years ago. These first species were fully developed and have baffled paleontologists as there are no fossils to provide even a hint as to their origin or how they evolved. Pterosaurs became extinct at the end of the Cretaceous period, 65 million years ago. They were an incredibly successful group of animals. During the 155 million years that they dominated the skies above the earth, they constantly evolved into new forms. This exciting new poster explores their incredible diversity. The picture captions cite biological and common names, where the fossils were found, when the animals lived and their wingspan. Each is also accompanied by terse text explaining its uniqueness and importance. 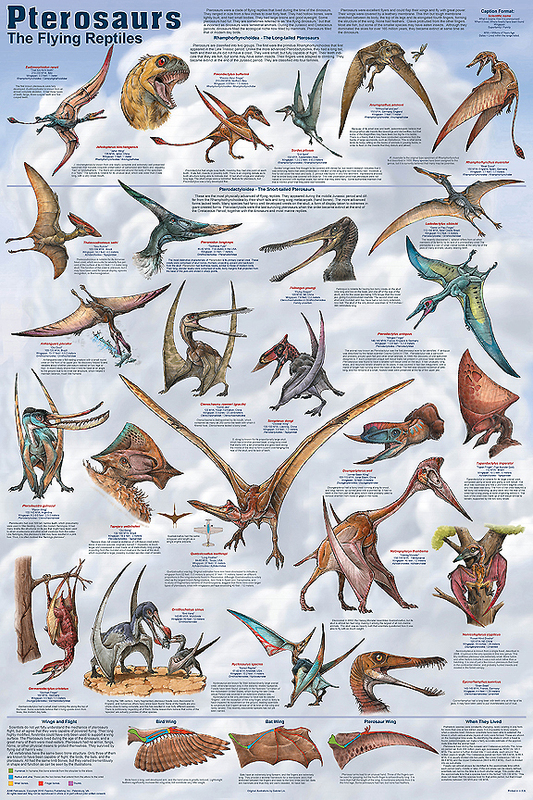 At the bottom of the poster, anatomical illustrations and text are used to explain the differences between the wings of birds, bats and pterosaurs. This is a truly beautiful poster. The species were illustrated by a paleontologist and are shown against a dramatic sky background. Standard poster is large 24" x 36" size that fits standard frames. Printed on heavy, acid-free paper using non-fade inks, then coated to provide satin finish and provide protection from UV rays and scratching. Laminated poster is standard poster encapsulated in heavy 3 mil plastic.